It is difficult to equate fun with pain. Tempo runs. Hills. Long hours up and down the trails. Running can be painful. And pain usually isn’t fun. But as any runner knows, running can be one of the most enjoyable activities out there! After all, why would we spend so much time doing it if we weren’t having a good time? When things are going well, it is easy to forget the tough times, but when those tough times poke their little head out, it is even easier to forget why you love running in the first place. I was reminded of this when my good friend Alex Bea shared an article with me. We’ve shared many miles together, including the last 15 of my first 50 miler, so I know that he loves running. But like many of us, his love for running can feel more like a middle school relationship than a marriage. It’s love you one week. Avoid you the next. Sometimes we get so caught up in our training plans and mile splits that we forget about the joy of running. I wanted to share Alex’s article, because after he forgot about that joy, he found it in an unexpected place. I started running regularly in 2010 when my cousin invited me to join her in a half marathon in Virginia Beach that September. I was fully in the spirit of self-competition and reviving the feeling of pushing my physical limits that I knew as a college athlete years before. Fast forward a couple of years later, I continued, mostly off as well as on, to run in DC. I also moved a few times and my frequency of running correlated with how easily accessible continuous trails were — as I am lazy and don’t like stopping every other block for traffic. It was Doug who inspired me enough to trek from my DC apartment in Capitol Hill specifically to run in the woods of Rock Creek Park. I was to pace him on the last stretch of his first 50 mile ultramarathon and thus had obligation as well as personal motivation driving me. It was in this new-found sport of trail running that I rediscovered the pure pleasure of running–it was play again. I still enjoyed pushing my body to be stronger and faster, but trail running wasn’t just running. It was running in the woods. It was running away from people and straight lines. Trail running is running around things and jumping over things and speeding down hills and racing to the top, dirt flying. This was running like a kid. Watch a kid run. If they’re not imitating adults–grimace-faced and arms pumping–they leap, zig-zag, and fall in the dirt on occasion. This, including the latter, is what I found in trail running. Sure, I also will think about short strides and mileage, but those are more… suggestions rather than the core experience. Recently, as I now live in DC’s Columbia Heights neighborhood, and have easier daily access to the park trails, I’ve found myself running like a kid in other ways as well. Running in the woods on my own last week, I started to get a little lost on my way back home. I was losing track of the actual trails, getting tired, and was no longer concerned with speed or goals. And I started to imagine. I imagined as I ran through the woods that I was on the run from a post-apocalyptic gang of land pirates on the south and trying to avoid the harsh aristocrat gang guarding the manicured lawns to the north. All I could do was keep running. If I kept to the woods, making my body better at out-maneuvering them with every stride, I would be safe. I would know these woods better than they and, like Robin Hood or the Ewoks, be able to deal with them on my own terms. The only rules were that I couldn’t exit the trails to the neighborhood streets on one side of me and that I couldn’t stop. The next time I go run in the woods they could be zombies after me (which has actually become a run) or Red Dawn-era Soviets (the new North Korean version isn’t worthy). Or maybe I’ll be running to something instead, such as a set of clues to a treasure. I do know for sure that the next time I step off the concrete and onto the dirt trail I’ll again feel like a kid whose prime training goal is to have fun–and maybe to tell myself a good story. 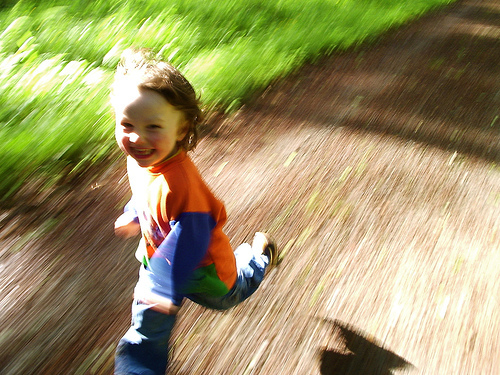 Maybe Jedi Masters aren’t your thing, but that doesn’t mean you can’t have fun by running like a kid again. Join a running group to make new friends. Find new trails or adventurous routes. Join a league sport and get your running in on the field. Kids run all the time. Not to log miles. But to play. Why can’t we? What brings joy to your runs? Narrowly escaping the grip of land pirates isn’t the only thing that keeps Alex Bea busy, he’s also a Rock Creek Runners group run leader, your neighborhood bike mechanic with The Bike House, and an internet wizard. Check him out at his website and on Twitter. Track is very simple, cheap can be for the young and old. Do not ever sports game that looks like a football, badminton and the like if you have any problems with the heart. dangerous! !